In 2014, Doors Open London and Doors Open Middlesex fall on different weekends, allowing adventurous Londoners to explore the wilds of Middlesex County and still view London attractions later in the month. Being restricted to one day of sight-seeing only, I couldn't even fit all the Middlesex locations into my schedule. But the fact that the locations were restricted to the western part of the county, mostly in the Strathroy area, made getting about a little easier. I chose to drive all the way out to Napier and work my way back towards London. Napier is an idyllic "ghost town," filled with hustle and bustle in the nineteenth century but now a quiet reminder of the Ontario of yesteryear. 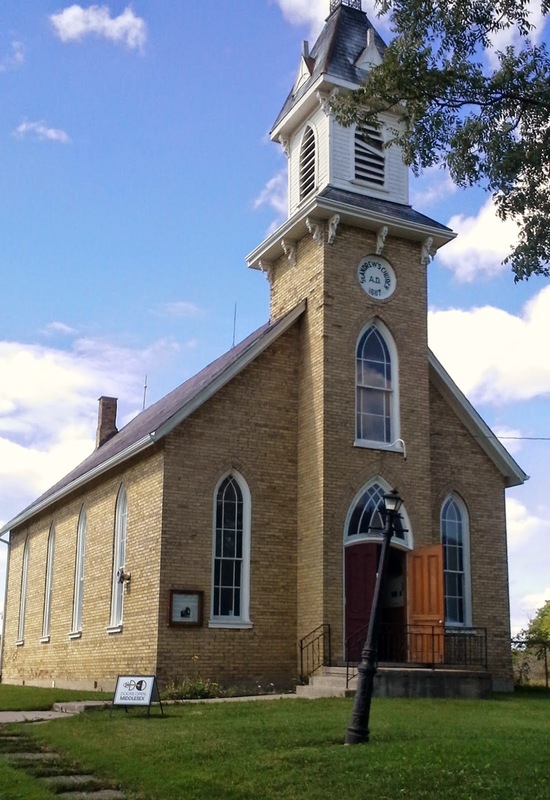 In an out-of-the-way location on unpaved Napier Road, St. Andrew's Presbyterian Church and surrounding hamlet might be a little hard to find, perhaps explaining why I was the only visitor at the church when I arrived about 1:00. It's disconcerting when there are more volunteers than guests so I hope there were other callers at this quaint 1887 brick building. The inside is plain and simple, not surprising for a structure built by a late-1800s rural congregation, and the sense of peace and calm is palpable. Not that St. Andrew's is a closed church; a small congregation of about 30 is using it for Sunday services. The congregation was founded in 1863 in an earlier church building, making last year a 150th anniversary. While in town, I also stopped at Strathroy Antiques Mall, not a Doors Open location, but if you like this kind of thing, than it's the kind of thing you'll like, so I thought it was worth a visit. It's very similar to London's Memory Lane with numerous antique vendors packed under one roof. It's wonderful and convenient to have so much material culture assembled in one location but, after a while, everything turns into an historical blur. I managed to escape with only a few items to add to my apartment's clutter of "artifacts." Finally, I made my way to Delaware to check out the new Middlesex Centre Archives. After campaigning in Middlesex County for years to create a general Middlesex County archives, a committee of heritage-minded citizens finally decided to go ahead on a more local level in 2013. The archives acquires and preserves historical records pertaining to Middlesex Centre, the former London, Lobo, and Delaware townships. Staffed by volunteers, the archives is still operated on professional standards, and well on its way to becoming the nucleus for a future county archives.